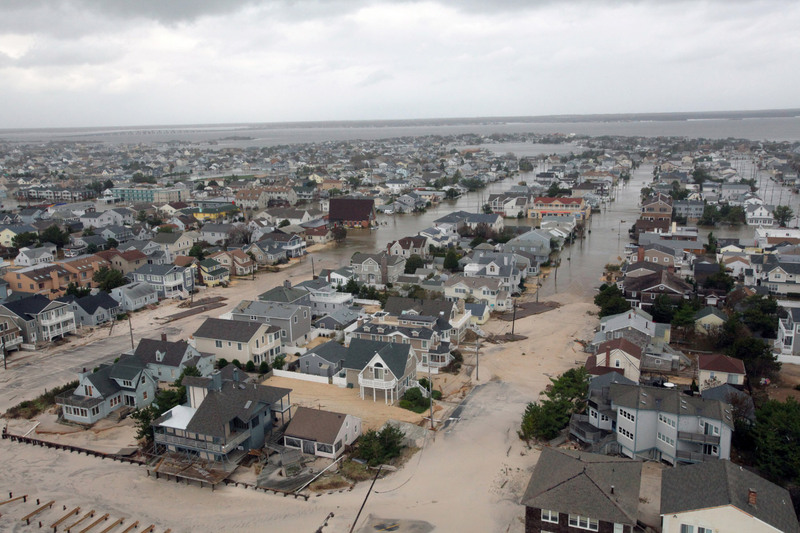 The shores of New York and New Jersey are, as Hurricane Sandy demonstrated in 2012, particularly vulnerable to flooding, sea level rise, and extreme weather events. Coastal construction has become more resilient (though some question to what end) and flood prevention ideas both big and small have been floated to protect the area’s shores. Now, the U.S. Army Corps of Engineers has proposed several different approaches to preventing flood surges using gates and berms in and around New York Harbor, and environmentalists are sounding the alarm. The proposals are part of the New York-New Jersey Harbor and Tributaries Coastal Storm Risk Management Feasibility Study, a 2,150-mile survey of the region’s most vulnerable areas. The Corps has put together five schemes—four that use storm barriers, and one “as is” projection—and is soliciting feedback from New York and New Jersey residents with a series of information sessions this week. 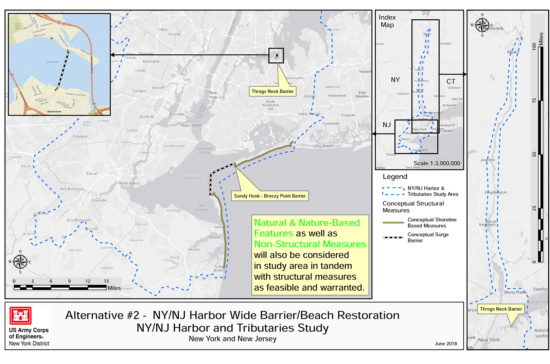 In designing floodwalls for New York Harbor or the Hudson and East Rivers, the Corps will need to balance ecological concerns with property protection; nonprofit clean water advocacy group Riverkeeper has called the Corps “hard infrastructure” solutions, those that use concrete barriers, detrimental to the health of the harbor and its waterways. The Hudson River is technically a tidal estuary and not a full-fledged river. Salt water from New York Harbor, and in turn the Atlantic Ocean, flows back up through the Hudson and mixes with fresh water from tributaries upstate to create a nutrient-rich environment. If the Corps’s plan to install a five-mile-long gate across the harbor’s mouth between Sandy Hook, New Jersey, and Breezy Point in the Rockaways came to pass, Riverkeeper argues that the barrier would slowly cut off nutrients from the harbor and prevent contaminants from washing out into the ocean. The Corps alternative plans include: building berms, dunes, and seawalls across the lower-lying sections of the New York-New Jersey waterfront, with small floodgates across a few waterways; a barrier across the Staten Island-Brooklyn gap spanned by the Verrazzano-Narrows bridge and gates along Jamaica Bay; and targeted berms and seawalls across targeted low-lying coastal areas without any gates. Creating a centralized approach to flood prevention could be more effective than the piece-by-piece method currently being enacted but comes with its own set of risks. If a massive gate were installed to prevent flooding, it would need to be closed more and more frequently as sea levels rise and would increasingly cut off New York and New Jersey’s waterways from the ocean. Planning for a storm that currently has a probability of occurring once every hundred years may be futile as storms of such intensity become increasingly common. Seawalls have been linked to increased erosion, and if water builds up behind the wall, it can be hard to fully drain the affected area. The Corps is looking to identify a scheme to move forward with by the middle of this summer. However, with a possible price tag of $20 billion and several years of construction likely, whether or not the Corps can follow through is unclear.